In the past two weeks, since Spring started springing, I’ve been enjoying the harmonies of American Robins and male Red-winged Blackbirds on some of my morning walks. Yesterday, I got treated to some new tunes. Song sparrows! So many of them! It was a beautiful sunny morning along the Bow River at Bowmont Park. The leaf buds of the many, many balsam poplars have opened up recently and the glossy new leaves were reflecting the sunlight with vim and vigor. 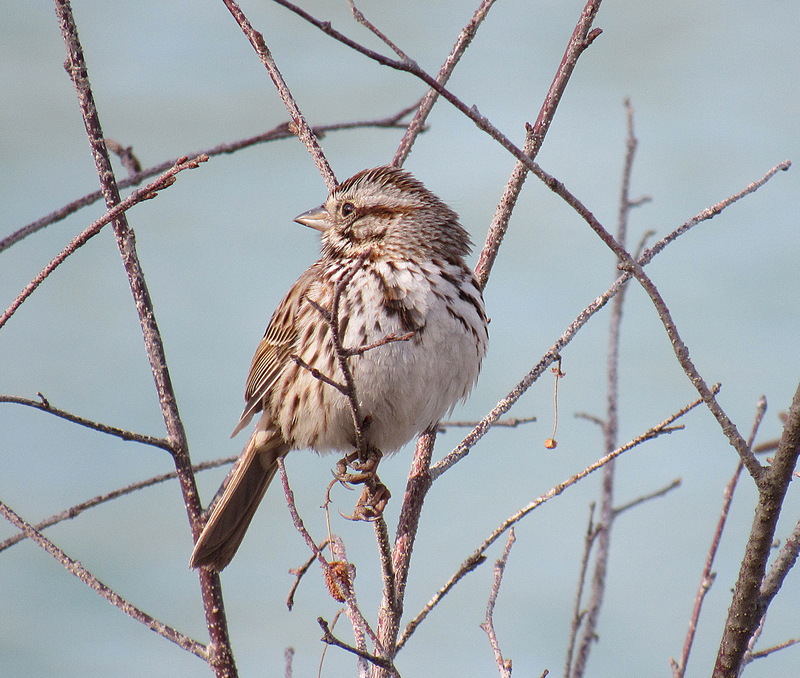 The song sparrows tended to stay on their perch for a few minutes, so when I heard their song, I often had some time to locate their whereabouts. Most birds didn’t find me too scary and let me photograph them for a while. I photographed this bird’s head in almost every possible position. Since the song sparrows didn’t seem to mind performing for me, I decided to try a little video. Not the best sound, and my hands were not perfectly steady, but the video does capture more of the magic of their song than just a still photograph. Plus you get to see the little birdy moving around a bit! 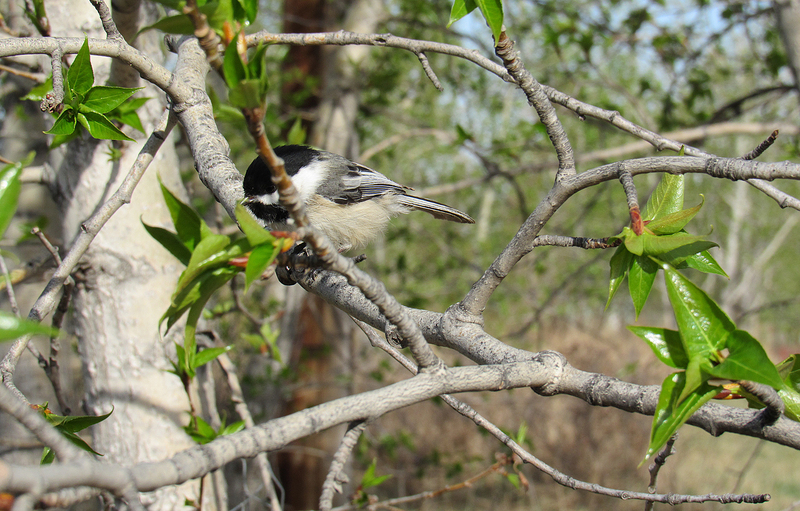 And in case you are super curious about those shiny new balsam poplar leaves, here is a black-capped chickadee hanging out briefly on a balsam poplar branch. This little birdy seemed very curious about me (likely wondering if I was carrying some seeds). It perched on my bike a couple of times and on various branches on the trees all around me. Thanks Sherry Lynn :-). Glad you enjoyed it! Such a wonderful encounter with the song sparrows and chickadee, Myriam. 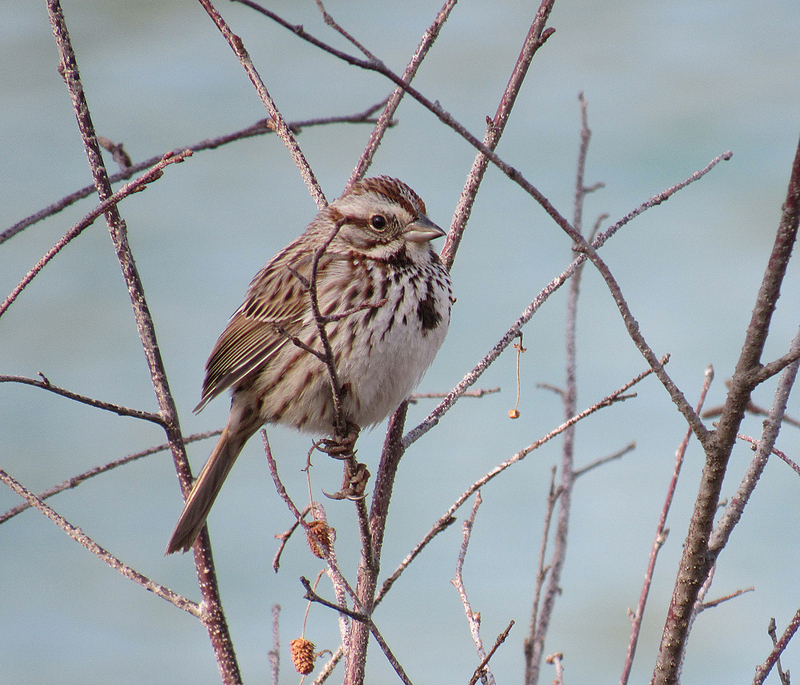 Your video captured the song sparrow’s beautiful melody so well. And those brand new poplar leaves are so bright with spring. Thanks Jet :-). I’m glad you enjoyed the video! It was a wonderful spring day – the colours and sounds and smells and the gentle warmth. Great photos. It is almost like the bird was posing for you. I enjoyed his song on the video as well. Looks like it was a beautiful spring day and it appears you made the most of it! Thanks Carol :-)! Yes, sometimes it does seem like the birds are posing. I thought maybe the spring hormones were making them extra brave. Hope you are enjoying the spring and bird songs in your neck of the woods. Sounds like a wonderful afternoon :-). Thank you for sharing it. My husband, cat and I also like watching the birds and squirrels that frolic outside our apartment windows. I think the courting energy of the animals is one of the many things that make spring extra-special. Since spring started Springing. Quel eclosion de Bonheur. Myriam Cherie ,tu m as comble de Bonheur. que tu devais avoir des provisions ds tes poches pr attirer la faune. Merci pr apporter tant de joie ds ma vie. Bonne journee et je suis tjrs ds l attente de tes nouvelles excursions. J ai egalement recommence a faire du velo.C est une bonne therapie pr mes jbes. Esperant que tu sois en bonne forme ainsi que J.
Oh what a lovely bike ride you had! The images are terrific, and the little video brought a smile to my heart and face this morning! Thanks Deborah :-)! So glad the video made you smile. Songbirds in the spring are so charming! I am in love with these cuties! Me too :-)! Lots of bird love in the air now that the warmer weather is back! We heard a migrant song this past week: Louisiana Waterthrush! Not quite as haunting a sound as the Wood Thrush but much more cheery. 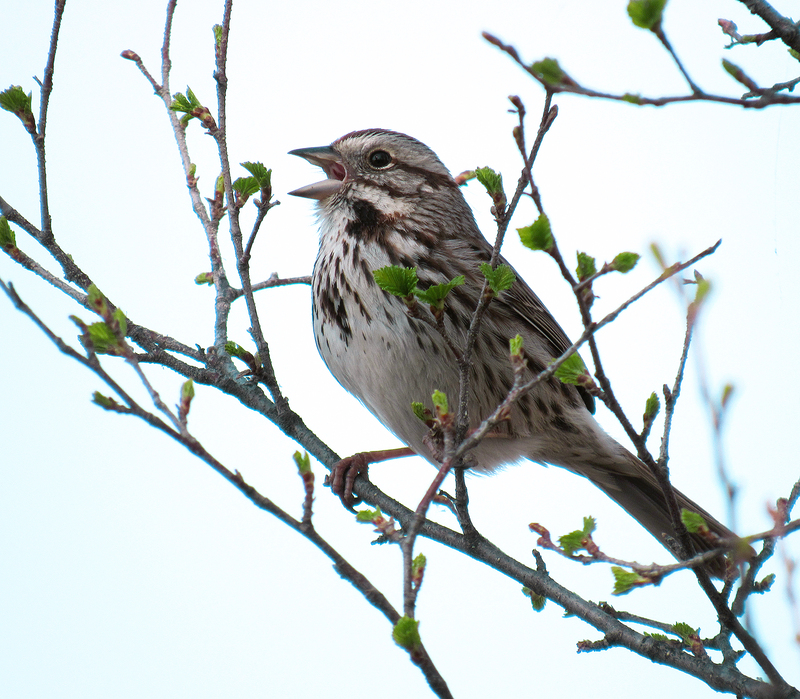 Very cool that you stop for a song sparrow show :-). I’ve never seen a Louisiana or Wood Thrush. I’ll check out All About Birds for their sounds. Hopefully I’ll meet more thrushes this year. I briefly saw my first Hermit Thrush late in the winter. Sparrows look glorious with their mouths open :-). Glad you enjoyed the photos. Thanks Stephanie :-). 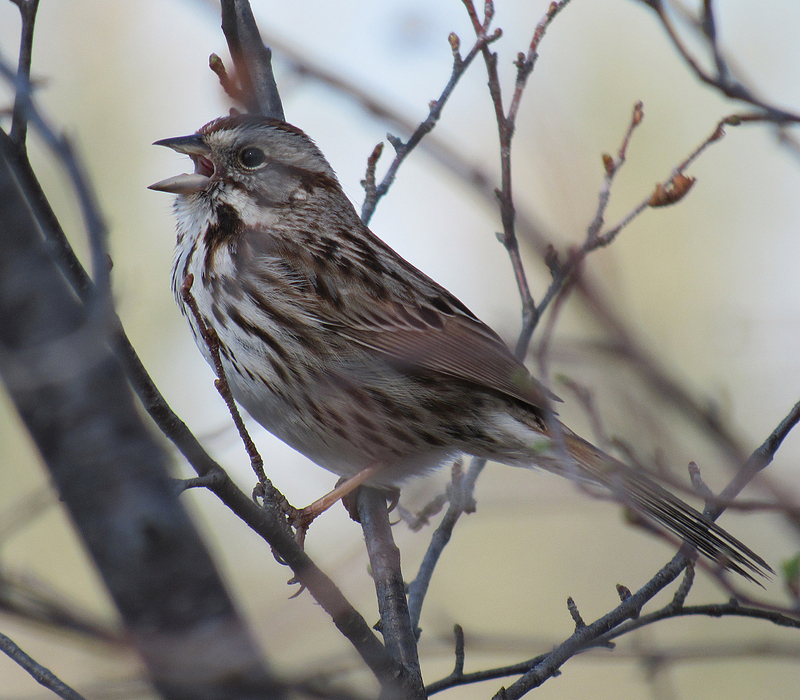 Singing song sparrows definitely fill the air with joy! Glad they sing to you too. Such a sweet sparrow and I love his song. Thanks Sharon :-). So glad you enjoyed his song! Great photos! I love the cheerful songs that greet us nowadays. We have a song sparrow in the front yard, along with a pair of cardinals and recently a chipping sparrow has been heard in the side yard. Breeding season is delightful! Thanks for the lovely compliment Eliza and for sharing the birds that are singing-it-up in our yard. Breeding season is delightful :-)! I haven’t seen any chipping sparrows here yet, but probably soon. Fantastic photos! 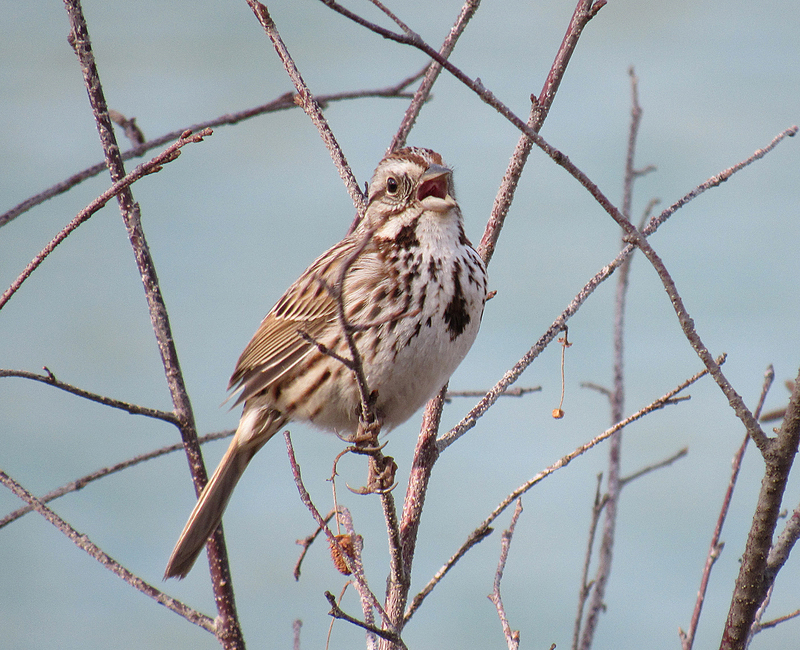 Song sparrows, Gray catbirds and cardinals songs are wonderful. Thank you :-)! Oh I hope I get to hear some gray catbirds this year. I heard two briefly last year. No cardinals around here though. Previous Previous post: Draw a Bird Day!! !